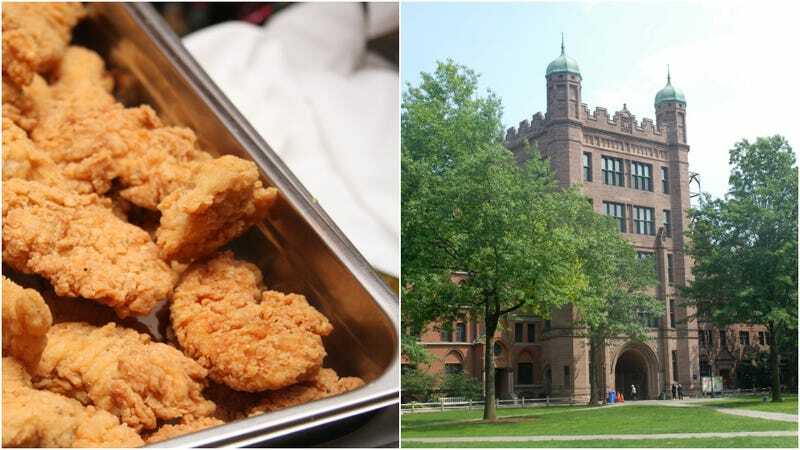 Yale students poured into the cafeteria on Monday only to be stopped in their tracks by a large sign reading: “Goodbye Chicken. Hello Tofu. Your favorite tenders are going meatless.” Reaction was swift and mixed, with #tenderpocalypse provoking one student to call the tofu tenders “the worst thing I have ever seen.” Vegans, at least, seemed pleased. But fear not, Yalies, the tofu tenders were but a merry prank, you see! The Yale Daily News reports it was an early April Fool’s joke put on by a student auditioning to join the Pundits, a Yale senior society specializing in this Ivy League brand of hijinks that might also include disorganizing the library’s Dewey Decimel system or replacing the science labs’ beakers with non-metric instruments. Gee whiz. Regular tenders are still available on Thursdays, a hallowed and revered day on campus. So seriously do the students take their tenders that there exists a website—Is It Chicken Tenders Day?—to answer that very question.